Oh my goodness, it’s Friday! I hope you are as excited as I am. Last weekend we had daylight saving (turned the clocks back an hour) so it has been pitch black every night this week when I leave work. Total bummer. But the great thing about it being Friday is tomorrow I can play outside in the SUN all day! And it’s suppose to be in the high 60’s and sunny. You know what that means? It means I’ve already planned a full menu for a lunch picnic with my puppy and boyfriend. 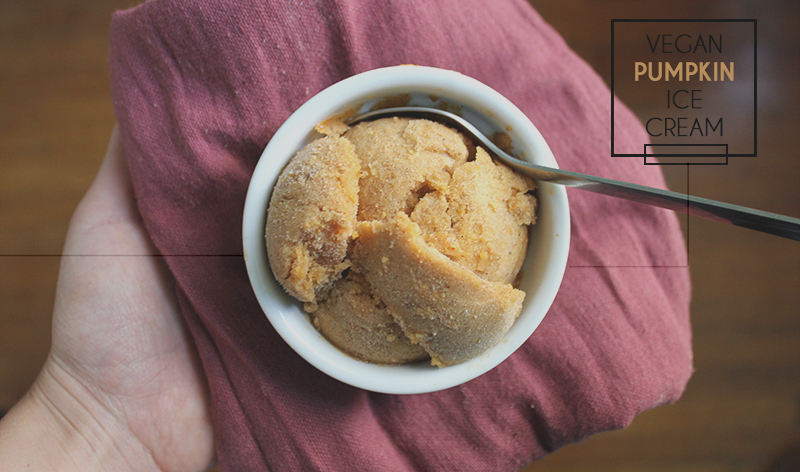 Anyhow, here is a simple and quick recipe for vegan pumpkin ice cream! I used bananas as the base which made the ice cream thick but the banana taste was masked by the pumpkin and cinnamon. Have you tried this trick before? Frozen bananas blended taste super similar to ice cream…it’s awesome. Whoever thought of this was a serious genius. I cannot wait to experiment with this concept more (I’m thinking…chocolate, banana, and peanut butter in our near future?!). Blend all ingredients in a blender until smooth. Serve right away (it will have a texture similar to soft serve) or let freeze for 2 hours to make firm. PS: Don’t forget to check out the wonderful giveaway I am hosting this week! What a fantastic fall twist to the good ol’ vegan banana ice cream! I will have to try this soon. This was great except I found the cloves to be overwhelming. I’ll just use a pinch next time because I’d rather taste the pumpkin and nutmeg more. Thanks for the recipe! This recipe has way too much spice! No one liked it in my family.